The Hubble Space telescope produced the finest Astronomical images in a generation, but Hubble’s time in the limelight has ended, and now it’s time for a new generation of both space- and ground-based telescopes to take over with their own jaw-dropping images and revolutionary science. Recently the Atacama Large Millimeter Array (ALMA) has taken the leap and used its full power to take an astonishing image of the protoplanetary disk of the young star HL Tau. This image is of a very young star, only about a million years old (Which is really young compared to the 4.5 billions year old Earth). The star is shrouded in its birth cloud of gas and dust, and cannot be seen with optical telescopes. However, with the ALMA millimeter image, we can see the entire system forming, including clearly defined gaps in the disk. As a clump of gas and dust collapses to form a star, it begins to rotate and flatten as the density increases, due to conservation of angular momentum. Once the star forms in the centre, the disk continues to spin, and small clumps can form due to gravity. This is where the planets come from. As planets form they begin to sweep up material from the disk, creating gaps. The planets also use their gravity to create gaps at distances that are multiples of their distance from the star. This same resonance phenomenon occurs with gaps in the rings of the gas giant planets in our own solar system. We can see this happening in the image above. Each gap represents a planet or a resonance. We have never seen this kind of detail in real life! Once the analysis of the image is complete, we will see how many planets are forming in this disk. Astronomers do this by using computer simulations to determine how many planets would create the ring pattern in the image. ALMA uses baseline interferometry to obtain extremely high resolution images in the millimeter and submillimeter wavelengths, which fall between microwaves and infrared waves on the EM spectrum. 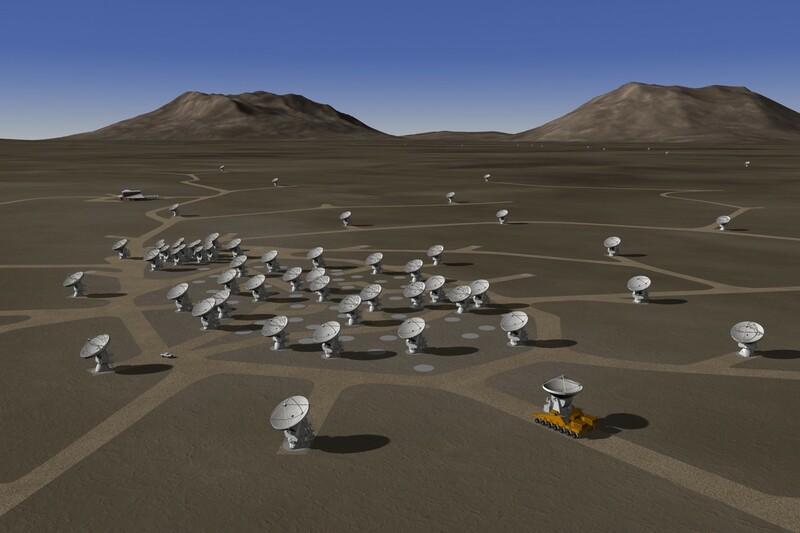 By using a large number of antennas (ALMA uses 66) spread out over an area, the telescope can take high resolution images as if the telescope was a gigantic single dish. The larger the distance between the telescopes, the higher the resolution of the images! The other great thing about ALMA is that the antennae can be moved, giving astronomers the option of using different configurations to achieve the best results for the object they are observing. We will be hearing (and seeing) from ALMA a lot more in the future. I am really excited to be a part of this future where telescopes I couldn’t dream of have been built and are probing the secrets of the universe at a deep level.